June | 2011 | "é rayhahn, rayhahn"
Ryan from “O” No!!! Another Orioles Blog sent me an email to bounce a trade off me, which I was more than happy to entertain. While I was piecing together some of the cards on his wantlists, his package arrived here with a slew of Twins. The lion’s share were Bowman singles from several years (I’ve said it before: I don’t entirely get Bowman), as well as various other brands. Time to hit my LCS for some more wantlist items, it appears. Interestingly, I received the non-Atomic Refractorized Todd Walker preview card just last week. Did you leave this card in your window for a few years, Ryan? Todd looks a little washed out. Thankfully I had this waldo on site so as to avoid the radiation. Thanks, Ryan — your return package is being built even as we speak. It’s been just over three years since I lost good friend and co-worker Steve to skin cancer, and I thought it appropriate to dedicate this Friday’s random 10 to his memory, and include some tracks which he introduced to me. Steve and I had a whole lot of overlapping interests, including prog rock. Growing up in St. Louis, he was introduced to several bands that I hadn’t had as much access to in my past, and we had a nice CD exchange program going for a while. Please, do periodic skin self-evaluations, for those you love. We miss you, Steve. Thanks for the cool trade, Bruce! What can we uncover regarding the play on the front of this card? 3) initially looked like a stolen base attempt, but Lou is not someone who would be stealing, particularly in the second-to-last season of his career. We’re probably looking at an erroneous throw from the left side of the infield. – the only candidate for this play occurred in the bottom of the 7th inning of this game on June 5th, 1994. Whitaker singled to lead off the inning. On a 1-1 count, Travis Fryman hit a ball between short and third; the throw to second was off the mark and Knobby had to leap for it — either a tough play or a generous offical scorekeeper, as it was ruled a single. Must have fired Knoblauch up though, as he hit his second homer of the game in the Twins’ half of the 8th, the go-ahead and last of the Twins’ three runs. Interestingly, the first six runs scored in this game were all on solo home runs, but in the bottom half of the 8th the Tigers took back the game for good. Carl Willis didn’t do Scott Erickson any favors in this one. Three-way trades? How blasé. All the hipster card traders are dabbling in four-way trades now. Pretty successfully, too. In the midst of some other trades, I got an email from Tony of Ike’s Cards asking about a trade. A (more-or-less) local trader to me — cool! The father-son trading duo had several Twins cards I needed, including a Thome relic and a Gassner auto card; problem is, Tony collects Cardinals cards, and Ike collects Markakis cards (among other PCs), and I was lacking inventory in both areas. Time to hit the rolodex. 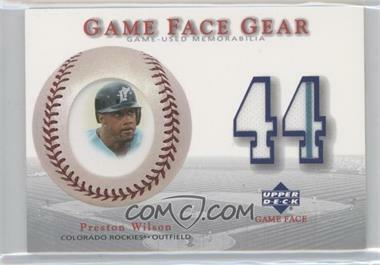 Back during my eBay experiment, I purchased a two-card lot of jersey cards, one of them being a 2003 Upper Deck Game Face Gear #GG-PW Preston Wilson jersey card, like this one. I already had a couple cards saved for hiflew at Cards from the Quarry, so I asked if he was interested in it. He was, but didn’t have a comparable Twins card to trade back, so we sat on it. But not for long. Daily Dimwit turns out had a 2007 Masterpieces auto of Glen Perkins that he’d picked up off eBay…FROM THE SAME LOT I HAD BEEN BIDDING ON AGAINST HIM. Yeah, we shared a laugh about that one. Well, turns out Double D had already tapped out any Astros cards I had to trade to him, but on a whim, I asked hiflew for a favor. Yeah, he was already thinking to trade with Dimwit, so…you guessed it, another three-way trade. DD also threw in a novel minor league card; I don’t actively collect minor league Twins, but I don’t turn them down, either.